Carriage Tours Mackinac Island, the perfect way to see the sites. 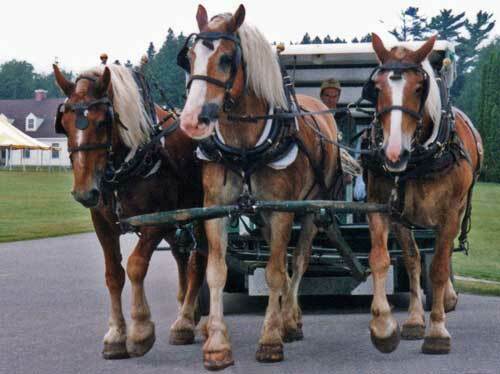 Carriage Tours Mackinac Island: what a great way to experience the true flavor of the Island where “Horse is King”. Many people who are new to the Island take the Carriage Tour which leaves from downtown, across from the Arnold Line dock. Your first stop will be Surrey Hill where you will disembark. 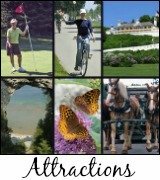 You will have the opportunity to explore Surrey Hill, visit Wings of Mackinac Butterfly House, a get a bite to eat, is you so desire. When you have finished exploring Surrey Hill, you will board a larger carriage drawn by a team of three draft horses for the remainder of your tour. 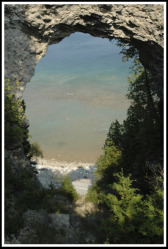 This group tour covers many of the Island highlights such as the Grand Hotel, Surrey Hill Carriage Museum, Skull Cave, the Military Cemetery and Arch Rock. The drivers will give you an overview of Mackinac history along the way. Caution: be prepared for some corny jokes en route! You can end your tour downtown or opt to disembark at Fort Mackinac which we highly recommend. The Fort offers an interactive experience that will let you picture what it was like to live on Mackinac Island as a military person or family member. There is a great Gift Store for choosing the perfect souvenir of your vacation. You can also eat lunch at the Tea Room. The view is amazing from the cliff side tables! You will have to purchase tickets to enter Fort Mackinac. Keep in mind that your ticket will also allow you to enter all of the historic buildings in the downtown area. If you need a carriage that is wheelchair accessible, call 24 hours in advance to make a tour reservation: 906-847-3307. The carriage tours Mackinac Island are pet friendly, so rest assured that well-behaved pets are welcome. Make sure that your dog is on a leash! If you love horses then plan to be on Mackinac Island this summer for the fun and fabulous Festival of the Horse. This event is becoming popular, not only on the Island, but also so around the world. Let's face it there's not that many places where the Horse is King! 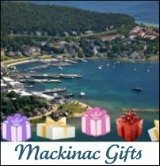 Explore hotel options for your Mackinac Island Vacation! Marcia and Kathy's Insider Tip: Set your alarm clock! Arrive at Surrey Hill about 6:30 in the morning to see the drivers and horse handlers readying the horses and carriages for the day. Be the early bird and catch the action! Don’t forget your camera whenever you are out and about as there are photo opportunities at every turn. Check out Golfing On the Island - great fun and a unique experience!